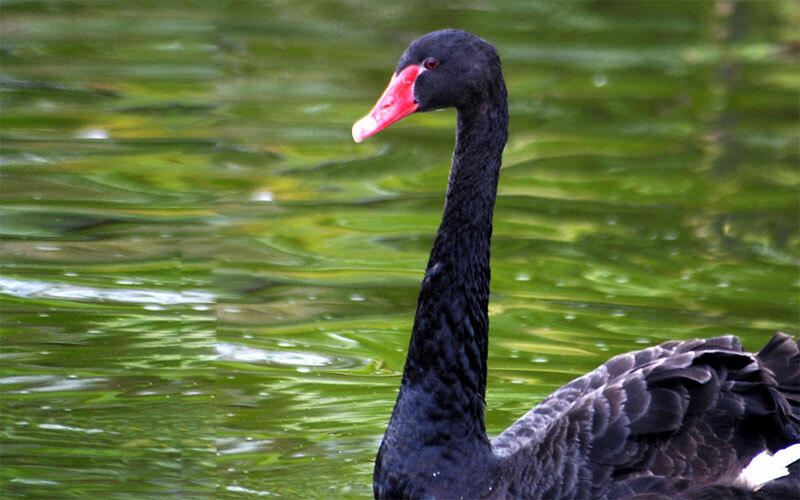 Black swans are large birds with mostly black feathers with white flight feathers. The bill is bright red with a pale tip and their legs and feet are greyish-black. Cobs (males) are slightly larger than pens (females) with a longer and straighter bill. The black swan utters a musical and far-reaching bugle-like sound called either on the water or in flight as well as a range of softer crooning notes. It can also whistle, especially when disturbed while breeding and nesting. When swimming, black swans hold their necks arched or erect, and often carry their feathers or wings raised in an aggressive display. In flight, black swans will form as a line or a V, with the individual birds flying strongly with undulating long necks, making whistling sounds with their wings and baying, bugling or trumpeting calls.